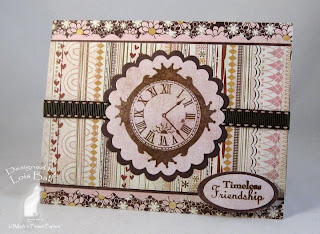 This is my last card as Guest Designer for Speedy the Cat's Friends Challenge on the Mark's Finest Papers Blog. Geri was the hostess and wanted us to make a Friendship card. 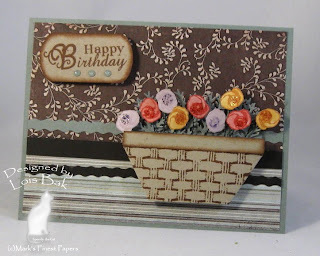 I hope you don't think this card is too "busy" with all the different DPs from the Basic Grey Sugared paper pad. I used one of the sketches from Page Maps, a favorite site of mine for card layouts. 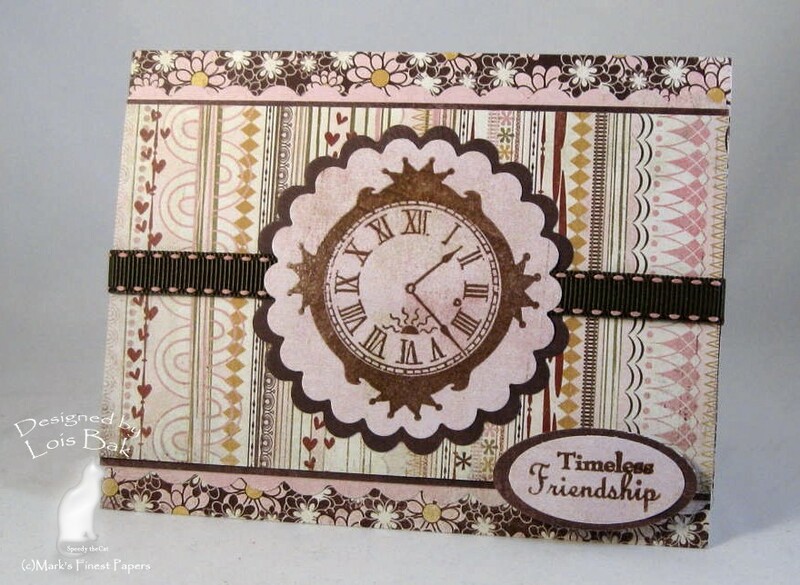 The clock, from the MFP Take Time and Father's Day set, is stamped with Versafine Sienna on the pink and then cut out with a scalloped circle Nestabilities die. The rest is pretty self-explanatary. 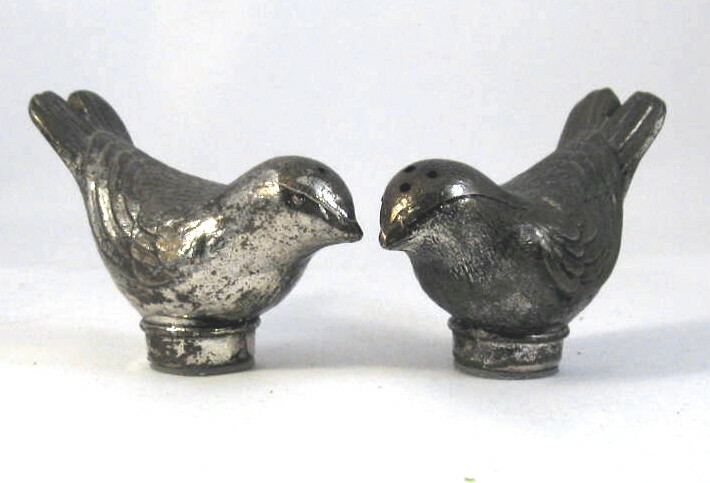 You'll have to take my word for it that these salt & pepper shakers relate to my card. They are from London, and one of those pictures is of Big Ben. 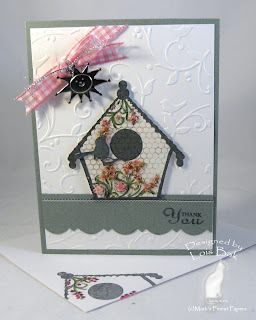 Vicky Gould was hostess for this week's Stampin'B's Design Team Blog challenge. 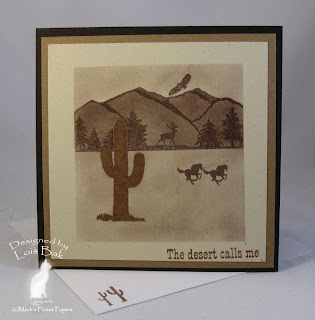 Her choice -- a square card of any size, western in theme. I decided to do a monochromatic card for her challenge. After masking off the edges of the Corn Husk cardstock with Eclipse tape, I stamped images from two different Mark’s Finest Papers’ sets (Regal & Proud and Southwest Cowboy). The cactus was stamped first, using Versafine Sepia and clear embossed. Then I stamped the mountains in the background and the two horses. Finally I sponged in the sky, mountains, and ground. The sentiment is just the first line of the haiku by F. Kessler from Southwest Cowboy. The card base is MFP Deepest Mahogany with a mat of Hazelnut. Western is not my style, but I’m happy with the result. I've had these cowboy boots salt and pepper shakers for quite some time -- I found them at a flea market. 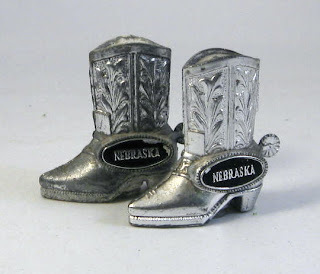 They were apparently used at one time because the salt in the one boot has tarnished (beyond repair) the finish. This is my card for Geri's Harvest Theme challenge on Mark's Finest Papers blog this week. I chose a soon-to-be-released set from MFP called Autumn Fun. Look for it in September. After stamping the basket of leaves with Memento Tuxedo Black, I colored it with Copic markers in various fall colors. Before removing the circle Nestabilities die, I sponged around the edge with Tim Holtz Distressed Wild Honey. One of my favorite neutrals has become MFP Corn Husk, so that's what I used for my background, matting the circle and some fall patterned paper from K & Company with MFP Hazelnut. How do you like that acorn charm? I thought it was really cute. The sentiment is stamped in Palette Burnt Umber and clear embossed. 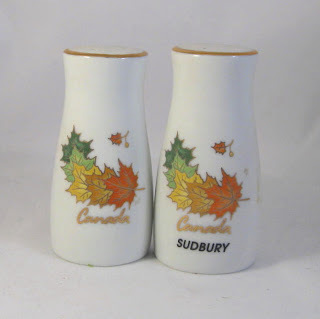 A Canadian friend of mine gave me these salt and pepper shakers. She divides her time between Sudbury, Canada and Florida. 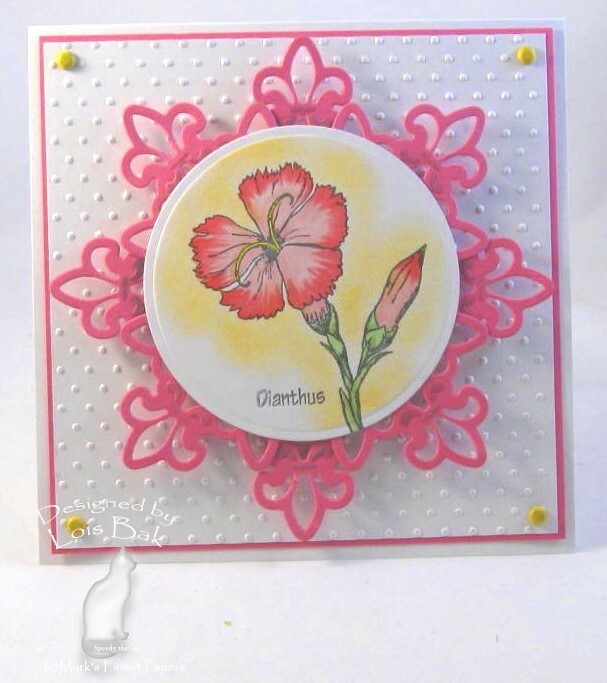 NancyRuth gave us a list of things to include on your Stampin'B's challenge card this week -- a diecut, a circle, and a flower. Actually I used two dies – my circle is a diecut also. My flower is a dianthus. I cut two Fleur de Lis shapes , trimming down one of them, leaving just the points. Not a lot of other explanation needed for this card. I wasn't too familiar with the dianthus, so I had to google it. Don't you just love Google? You can find ANYTHING!!! Coloring was done with Copic markers; sponging done with Palette Raw Sienna; and the background piece was embossed using the Cuttlebug Swiss Dots folder. The cardstock is from Mark’s Finest Papers Premium Paper Craft Pack – Spring Has Sprung. 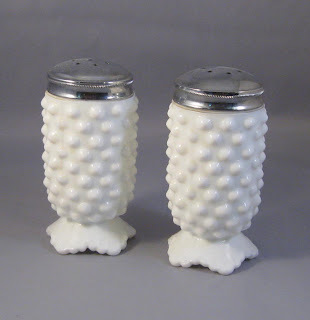 I don't have any salt & pepper shakers that even look like that flower, but I thought my hobnail milkglass ones coordinated with the Swiss Dots embossing folder I used. We have 4 New Stamp Sets: Tweet Blessings, Flourished Sea Creatures, Regal & Proud, and Owl Be Here. For your convenience, all 4 stamp sets are available for purchase TODAY! For your chance to win BLOG CANDY, visit and comment on each of the design team members' blogs on August 10th, 11th, 12th, and 13th. On Saturday, August 14th, a winner will be chosen FOR EACH DAY from those participants who visited all the blogs listed for that day! Four different winners, one winner for each day. THAT MEANS IF YOU MISSED A DAY, YOU STILL HAVE ANOTHER CHANCE TO WIN! 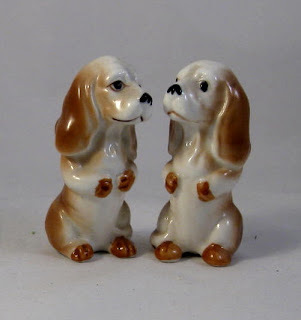 And, you can go back and comment, as the winners will be chosen Saturday morning!The 4 Winners will be announced on the Mark's Finest Papers Blog on August 14, 2010. Each winner will receive 1 Stamp Set that will be released NEXT month. 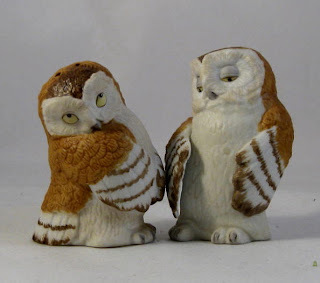 We end the Blog Hop with a cute set, Owl Be There. My first card for today is a birthday card for my daughter. Guess how old she will be! This set includes individual numbers along with the phrase, so you can make a card for someone who’s one or 101 – or anywhere in between. The owl is stamped in Palette Landscape and cut out with a Labels Nine Nestabilities die. Sponging was done with Palette Toile Pink. The DP is from Basic Grey Sugared paper pad. My second card is a little more colorful, using Basic Grey’s Green at Heart DP as the background. I love how the frame around this owl coordinates very nicely with the Labels Ten Nestabilities die. I couldn’t resist adding the googlie eyes to my owl. 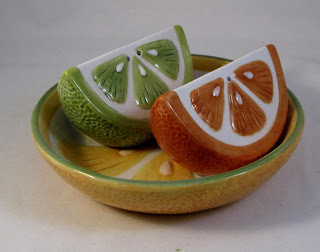 The border punch is from Martha Stewart. 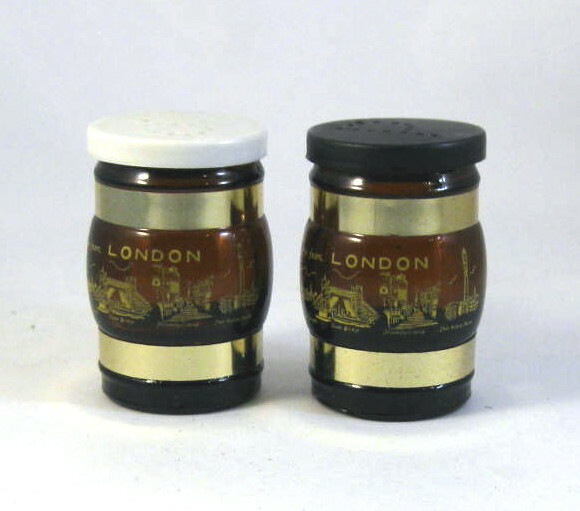 A pair of appropriate salt and pepper shakers from my collection. Faith was the hostess for this week’s Stampin’B’s challenge, and she wanted us to make a scenic card. 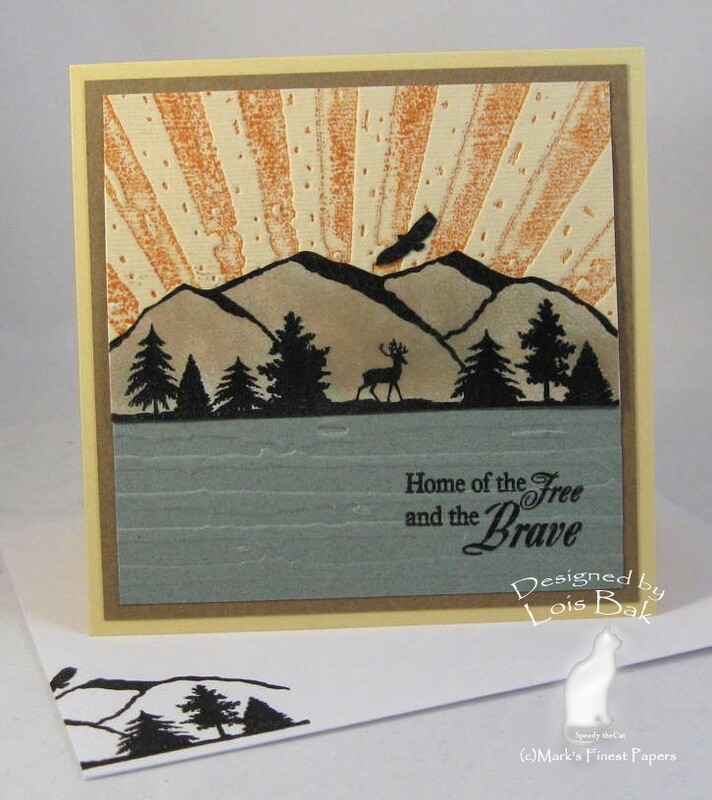 I created my scene using the mountains from Regal and Proud, sponged with Tim Holtz Distressed ink (Tea Dye and Bundled Sage) and then cut out. I glued it to a piece of yellow cardstock embossed with the Tim Holtz Rays embossing folder, which I had inked up with TH Wild Honey. 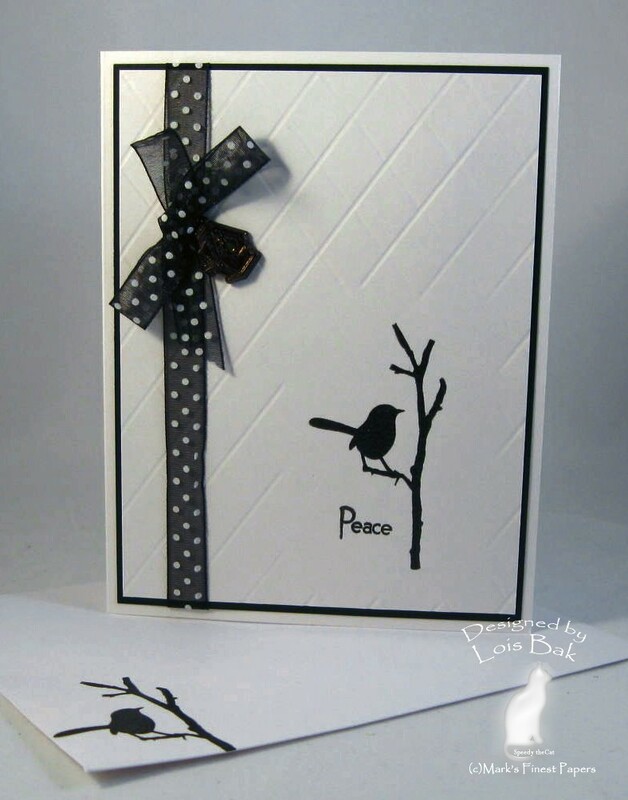 The bottom panel is also embossed – this time with the Cuttlebug folder Distressed Branches. 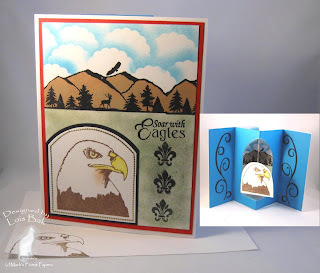 My second project was a little more involved – a pop-out card, which I made with the help of my Ultimate Crafters Companion. There was lots of masking and sponging in making this card. The same mountain scene from the front was used again inside. This time the eagle is suspended on a piece of twine in the opening. The black flourishes on the inside were cut using a long Sizzix die. 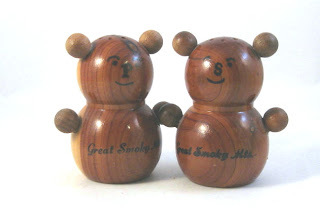 I doubt that the mountains in this set represent the Smokey Mountains, but these salt and pepper shakers are the only ones I have that seemed appropriate for today. Again I have created two projects with today’s set – Flourished Sea Creatures. Shaker cards are so much fun. I found some Shaker Card Pouches at StampFest Orlando back in May, so it’s much easier to make this type of card than when I first learned how to do it. 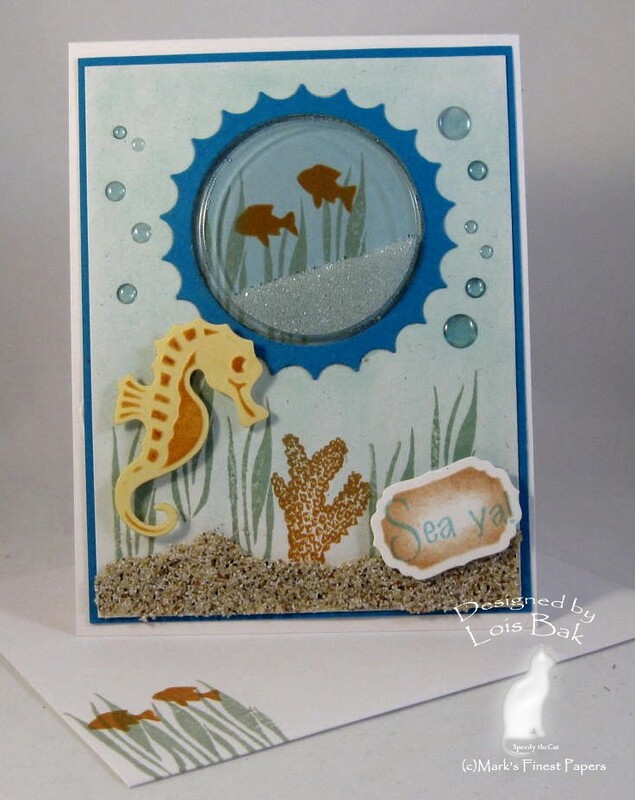 I stamped just the sea grass and a couple of fish for the background of the shaker section. 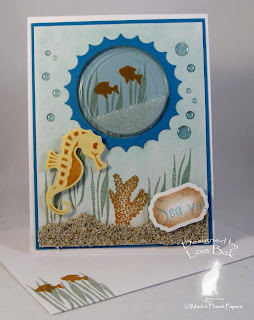 The scene on the outside is a little busier, with the Spellbinders sea horse die cut, the Mudd Puddles sea floor, and the dew drop bubbles. 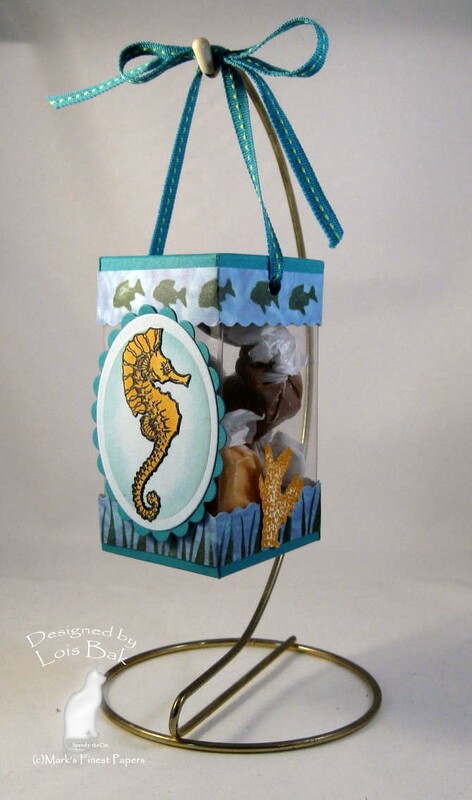 My second project is an acetate box, which I made using the tutorial in the resources section of Splitcoaststampers. I used cardstock from one of the Premium Paper Craft Packs called I’ve Got the Blues . . . and Greens – and some watery DP I had in my stash. Inside the box is, appropriately enough, salt water taffy! These kissing fish were my grandmother’s. 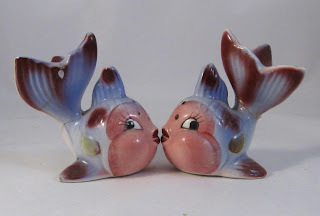 Be sure to visit the rest of the team to see what they did with this fun set and comment on each blog. You have a chance to win one of the stamp sets to be released in August. For your chance to win BLOG CANDY, visit and comment on each of the design team members' blogs on August 10th, 11th, 12th and 13th. On Saturday, August 14th, a winner will be chosen FOR EACH DAY from those participants who visited all the blogs listed for that day! Four different winners, one winner for each day. THAT MEANS IF YOU MISSED A DAY, YOU STILL HAVE ANOTHER CHANCE TO WIN! And, you can go back and comment, as the winners will be chosen Saturday morning!The 4 Winners will be announced on the Mark's Finest Papers Blog on August 14, 2010. Each winner will receive 1 Stamp Set that will be released NEXT month. I’m starting off the Hop with two cards for today’s set – Tweet Blessings. For my first card, I masked the two birds from the birdhouse and stamped it without them on a piece of Basic Grey Basics Manila and cut it out. Then I added the bird sitting on the branch – as if there were a perch on the front of the birdhouse. Using Copic markers, I colored the flourishes and added some Flower Soft. The background is the Bird and Swirls Cuttlebug folder. 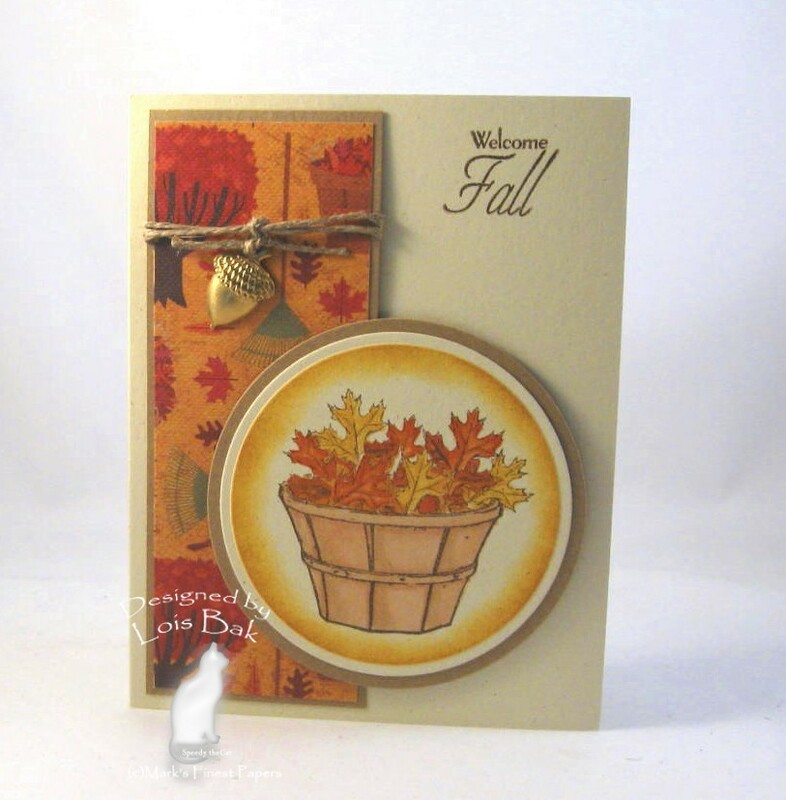 The card base and the shelf are MFP Autumn Greens. I decided to do a clean and simple card for my second project. I don’t often do this type of card. After stamping the branch and bird in the corner, I masked the image with a post-it note and diagonally scored the white panel. 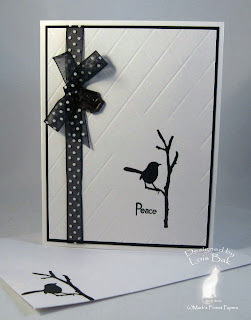 The rest is pretty self-explanatory – black matting layer, white card base and ribbon! 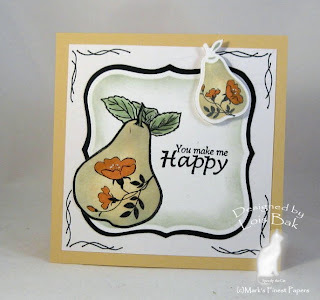 Vicki Dutcher asked me to be a guest designer for the Speedy the Cat's Friends' Challenge on the MFP blog for the month of August. 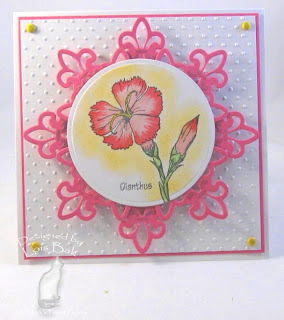 The challenge for my first card of the month was definitely quite a challenge -- make your own embellishments. So, after thinking for quite a while, this is what I came up with. I stamped the woven pattern from Backgrond Fun onto a small piece of MFP Desert Sand, then cut and shaped it into a basket. I punched lots of greenery, using the Martha Stewart branch punch, from August Greens -- my new favorite green. I made the flowers by cutting the very centers of the camellias from Apples and Camellia, sponged them a little bit, and attached them to some twisted wire with glue dots. After I put the basket together, I added the stickles. I cut the rick rack from some cardstock with the pinking blade on my cutter. 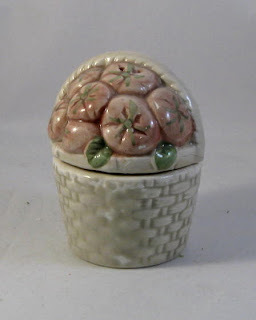 The "dew drops" were made by punching out three circles with a small circle punch and adding some Alene's Crystal Glaze. Whew!!! This salt and pepper shaker set is actually two pieces. The salt shaker is the flowers, and the pepper shaker is the basket. Today's Free4All challenge on SCS was Garden Pickin' Time -- make a card using things that grow in your garden. I made two cards, one with fruit and one with flowers -- neither of which grow in MY yard. I have a very brown thumb! My first card was FRUIT. 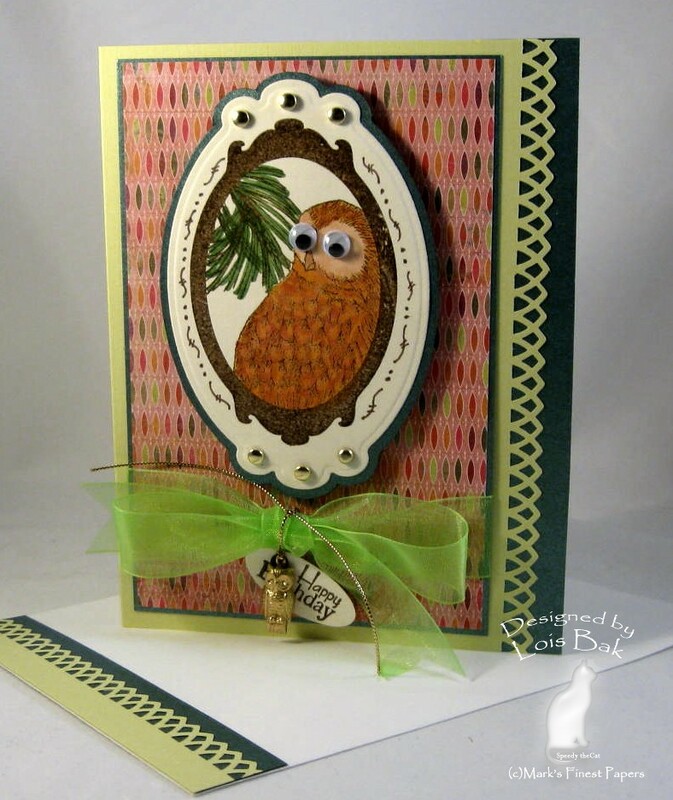 I took the opportunity also to use a new (to me) Spellbinders die set called Assorted Fresh Fruit. 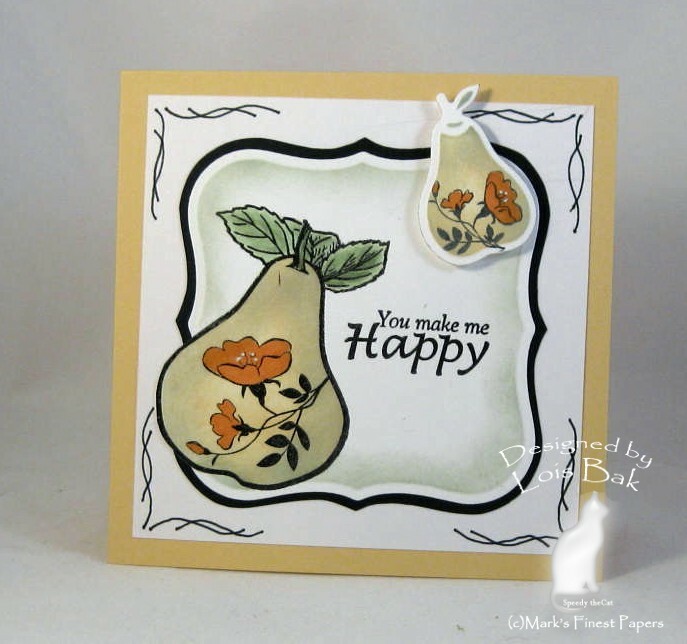 For the image on the diecut, I just colored the flower portion of the smaller pear stamp with a Memento marker and then positioned the die over the flower when I cut it out. I sponged both pears with Tim Holtz Distressed ink -- Scattered Straw and Bundled Sage -- and then colored the flowers using a marker. I like the way the "out-of-the-nestie" pear peeks over the black mat. All materials on this card, including the Spellbinders Shapeabilities, are available at Mark's Finest Papers. I had to do a second card using FLOWERS. 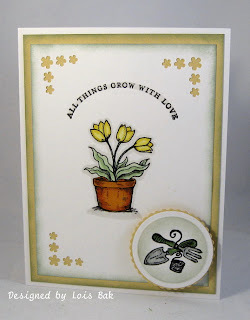 The flowers and the pot are two separate stamps, so I masked the flowers before stamping the pot. Both are colored with Copic markers. I don't have a lot of luck with CAS cards, so I had to add the little circle with the gardening tools. It felt better to me that way. To balance out that circle, I punched the flowers at the other three corners. 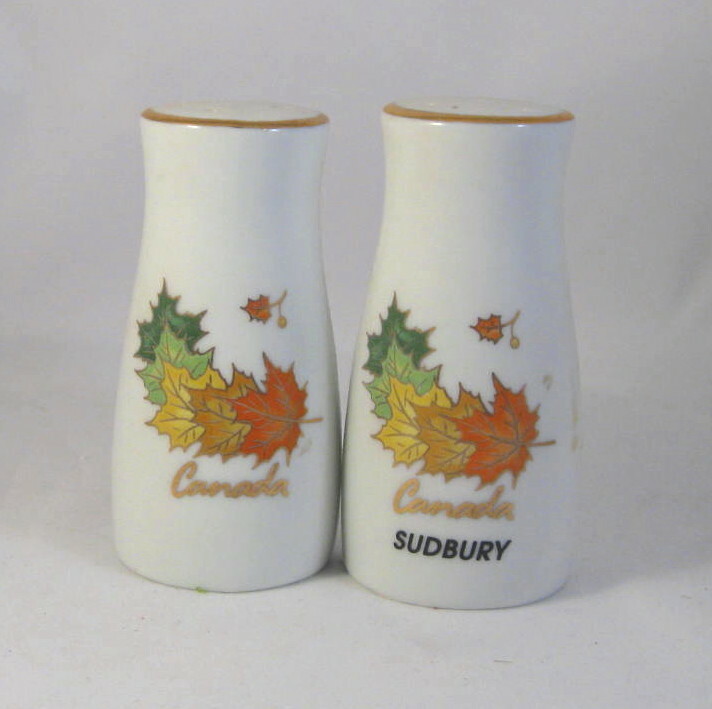 This is another set of salt and pepper shakers from my collection. It's not PEARS, but it is FRUIT! 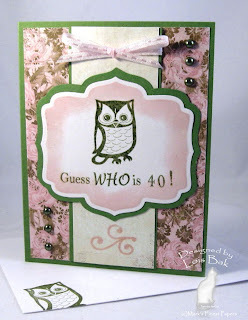 Joanne (jojot) was the hostess this week for the Stampin'B's DT Blog Challenge. 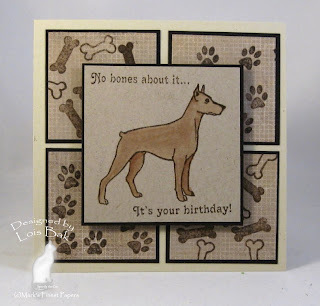 She wanted us to make a card in honor of the "dog days of summer." I’ve always wondered why August’s “dog days” were called that – so I looked it up. It has to do with Sirius, the Dog Star, and its conjunction with the sun during the hot days of July and August. But I digress! I made a monochromatic card, using several images from Mark’s Finest Papers set, More of Speedy the Cat’s Friends, creating both the main image and the DP panels behind it. The dog is colored with Copic markers in various shades of brown. One of the Stampin'B's, Brenda (benzi on SCS), mentioned that perhaps I should show some of my collections on my blog. Today's challenge gave me the opportunity to show one of my salt and pepper shaker sets. A good friend of mine gave me these cute little doggies. This is a quick post. I tried yesterday's Technique Challenge on SCS -- Plaid Silhouettes. Joan Ervin gave very good directions to create this look. The plaid was created by inking up the solid image with Memento Lulu Lavender and then dabbing over it with both Tim Holtz Distressed Tumbled Glass and Chipped Sapphire. It creates a very interesting look, don't you think? 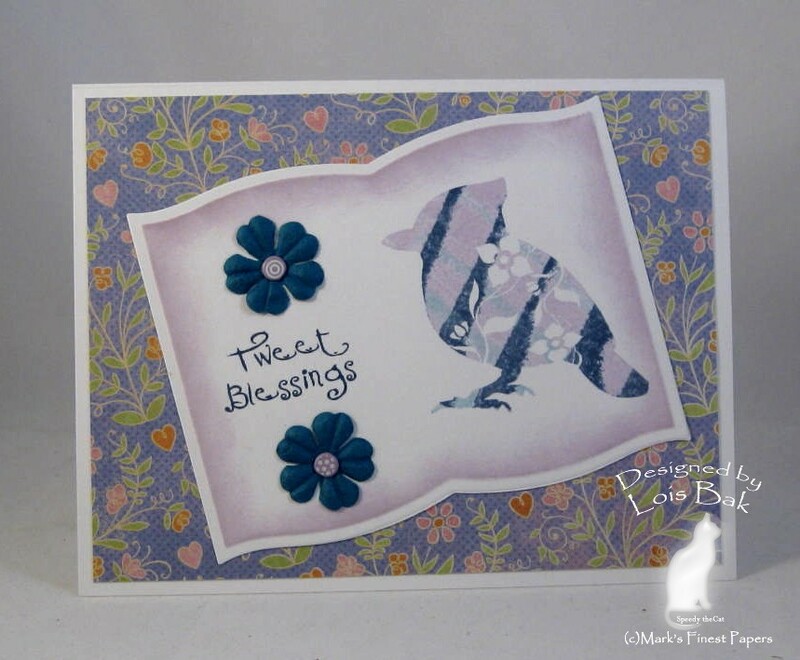 The bird image is from a soon-to-be-released set from Mark's Finest Papers called Tweet Blessings. Look for it next week.